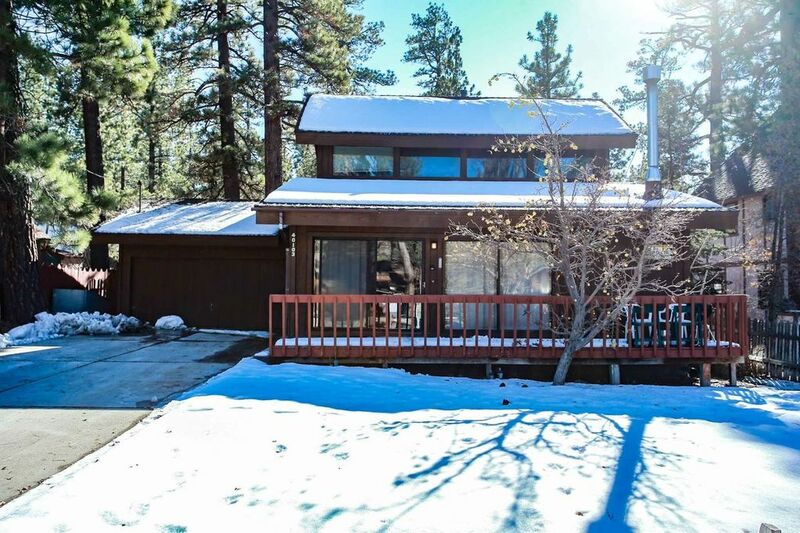 Le Trianon #121 is a wonderful lake-view two story mountain cabin that is located right across the street from the shores of Big Bear Lake and is within a short walk to the down town Village area for shopping or entertainment. This cabin has a basic but equipped kitchen with appliances including a dishwasher, plus there is an open dining room area with table seating for meals. The cozy living room area offers leather furnishings an a toasty fireplace, plus a TV/DVD player for your enjoyment and access to the wrap around expansive deck. This home offers a huge property with a front deck that overlooks the lake and a fenced back yard complete with a Charcoal BBQ for your use. Le Trianon is a great family cabin with mountain charm and the essentials, making this a nice place to spend your next Big Bear vacation. Our family of 5 stayed here for 3 days, 2 nights for a weekend of snowboarding at Snow Summit. The location of this place is perfect, and it has a nice view of some of the lake, and the surrounding area. If you need a basic place to stay that has all the amenities of home, this will work. It isn't fancy or nice in many ways, but it is a warm place to sleep, and the heater works well. The beds are frankly awful. They squeak and flop around, and were uncomfortable in all rooms, but they were clean and good enough to get by for a couple of nights. The cabinets in the kitchen are falling apart a bit, and there is plenty of evidence this place hasn't had any renovating since at least the 70's. The front door is sliding glass, and it is so hard to move that the kids couldn't do it on their own, so every 5 minutes we had to go open and close the door for them. This isn't safe, but we got by. The water heater was empty after 1 shower and it took over an hour before any slightly warm water was back for the next person, so some of us had to shower in cold water. We were all ok with our stay, but will not go back to this same location if others are available. In all, this place is good enough, but not great except for the location and size. Awesome Vacation home for family fun!! This was our family's first stay at a Big Bear Vacation Rental home and we loved it! The house was big enough for us all and had a very warm and welcoming vibe! It really felt like our home away from home! There were just a few minor things that needed improvement, one of the matresses in the downstairs bedroom was sunken in very deep, a couple of doorknobs need to be repaired, there should be a curtain for the kitchen window and it would have been nice to have access to park in the garage. Other than that, the house was cleaned well , ( except for a few extra ceiling cob webs), and ready for us when we arrived and we really enjoyed our stay!! Thank you for sharing your home with our family!! Thank you for posting a review. Big Bear Vacations values reviews as an opportunity to give a voice to our Guests. We utilize them to further strive for excellence. We are very happy you enjoyed your stay and appreciate the suggestions and have forwarded them to the Team. We are looking forward to serving your future lodging needs in Big Bear. See you soon! Stayed in Le Trianon for a night in last week of April. The property is very close to the lake and shops, and there is a limited view of the lake from living room. The property got enough space for 9 people to sleep comfortably. The property seemed to be very old, needs a major upgrade soon. Starting from carpet to bathroom fittings, everything needs attention soon. It looked like the house cleaning guys are not doing their job correctly. Carpet is dirty and there were dust everywhere. Unfortunately couple my family members started showing allergy symptoms after the night stay. Also the grill outside was really dirty and rusted which needed major cleaning before using it. Overall we couldn't enjoy the stay due to these issues. Added to the pain, the rental agreement needed the tenants to take the trash to the trash site. I have no idea why tenants need to throw away the trash when they charge extra for cleaning. Overall pretty disappointed with the choice we made, and won't be recommending to my friends. I believe the property got great potential if the management can spend little effort into the details. On the plus side, the check-in and customer service was excellent and appreciate the people in Big Bear vacation rental office. Thank you for taking the time to write such a detailed review. Big Bear Vacations appreciates all reviews and is committed to using review data to further strive for excellence. Be assured this info is being shared with the Owner of the home and Management/Leadership at Big Bear Vacations. There are a few things I would like to review for greater understanding. Trash removal from Big Bear Vacation homes is set by City ordinance. That is why there are designated Clean Bear Trash sites. Trash from Vacation homes of required by the city to be delivered to these sites. There is no regular Trash service to Vacation Homes in Big Bear because they sometimes sit vacant for extended periods. Big Bear Vacations has a ongoing cycle of Carpet Cleaning for our 330 Vacation Homes. We strive to keep these homes tended to at all times. Since these homes see a lot of seasonal Vacationers sometimes there is more wear and tear on these carpets than an average residence. The Cleaning Fee does not apply to Trash Removal or cleaning the Dishes, as this is the responsibility of the Guest. Properties are well maintained and meet the minimum standards all properties should achieve for a comfortable and relaxing stay in Big Bear. Furnishings are more current with minimal wear. Kitchen and baths are properly equipped. Appliances and electronics may be more basic than your home entertainment center but will provide enjoyment. We often stay, “comfortable, but could use a little updating, but we still had a great time at Big Bear”. These properties may or may not have internet access. It might be a good idea to call and speak with a Vacation Planner for your next stay so we can help you Select a home with a Higher Rating. Our Rating System is also described on our Website, and home Ratings are Displayed for each Home in the Description. I believe we can earn a better rating from you during a future stay and we would love that opportunity.